Byredo Gypsy Water has been around since 2008, but it wasn’t until a few weeks ago that I finally tried it. A friend gave me a Gypsy Water travel spray, and it’s been living on my dresser. Gypsy Water is clearly popular. Byredo offers a whole bathroom counter’s worth of body products to go with it. I understand why, and I often find myself reaching for a quick spritz. But the reasons I reach for it are exactly why I won’t be buying a bottle, especially at its price. Gypsy Water’s notes include bergamot, juniper berries, lemon, pepper, incense, orris, pine needle, amber, sandalwood, and vanilla. In short, Gypsy Water is a sort of Revlon Jean Naté for the incense-loving set. It’s easy to like, sweet and refreshing, and it wears off before you’ve finished your morning coffee. Gypsy Water kicks off with a prick of bergamot and sweet lemon over piney incense. Here, the romance of the “gypsy” part of the name prevails — I imagine cool nights and warm afternoons camping in the woods with dry pine needles under my feet and one of those darling gypsy trailers with worn velvet cushions, a mismatched tea set, and tassels hanging from the bedding. It reminds me of a lighter, sweeter version of Etro Shaal Nur. Within a few minutes, amber and sandalwood join the incense and soon swamp the rest of the composition. An hour later, the “water” part of Gypsy Water’s name becomes evident as the fragrance pulls up stakes and takes the caravan down the road. Until Gypsy Water vanishes, it has pleasant sillage and is gosh-darned likeable. If this girl weren’t on a budget, a jug of Gypsy Water would be wonderful to keep in the refrigerator for regular pick-me-ups. But at $150 for 50 ml of uncomplicated Eau de Parfum that performs like cologne, forget it. I’m more likely to reach for Piver Rêve d’Or for a friendly, inexpensive incense kick (and a longer life on skin) or, as I mentioned, Jean Naté. 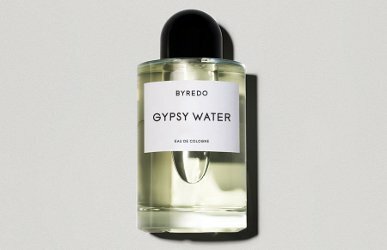 Byredo Gypsy Water was developed by perfumer Jérôme Epinette. The Eau de Parfum is $230 for 100 ml, $150 for 50 ml, and $110 for three 12 ml travel sprays. A 250 ml Eau de Cologne is available for $240, as is 7.5 ml of perfumed oil for $78. (If any of you have tried the cologne or perfumed oil, please comment on how it compares to the Eau de Parfum.) For information on where to buy Gypsy Water, see Byredo under Perfume Houses. Most Byredo fragrances have no lasting power in my opinion and they are very expensive for what you get. I admit that none of them have bowled me over yet, either, although some of them are nice. But I do like the packaging! Most of them are quite meh, but these 3 I like and last well on me: M/M Ink, 1996, Seven Veils. I like Seven Veils, too! Really? On me it was just a vanilla cupcake, certainly not the devastingly seductive vanilla I was hoping for based on the name. I wrote a review of it years ago. It might pay me to go back and look at it and see what I really thought. But the name is great. I was curious about 1996 but I think you decried it as dead now ???? in another post due to reformulation which saves me time and money I can spend on other fragrances…yay! I’ll have to find out more about 1996–obviously I missed the boat on this one. But you’re so right about money to spend elsewhere, if 1996 doesn’t stand up these days! Now I’m not so sure. The first time I sprayed the new bottle, I could hardly smell it compared to my previous bottle. But when I tried it again, I could smell it better. So it may have been a nose glitch. The other one you may want to try is The Peradam by Apoteker Tepe, it has some similarities, as does FM Dries Van Noten. I have a sample of 1996 that I got from a Neiman Marcus rep a little over a month ago, and I think it smells great. It’s strong and it lasts, frankly, until I’m tired of smelling it. New bottles, of anything, usually need a week or two to settle down before they smell right, at least to me. I’ve noticed that the first few spritzes from a bottle often are a bit “off,” too. I have not yet found a Byredo that I would truly like, but seeing the number of new launches they throw at us from Sweden, I’m not sure if I even want to find one (as you said, they’re not cheap). I think for now I’ll stick to discovering this australian gem Grandiflora is. I absolutely love Queen of the Night. Isn’t Queen of the Night amazing? I have about 3 ml of it, and I’m hoarding them. I’d love a bottle of it someday. I wish them all the best in finding new distribution channels so that more people can know about them. Interesting – I agree with almost all of your review except the part about it not lasting. I get whiffs of this all day from one spritz. I enjoy the body lotion, too. It vanishes on me, so I’m glad to see your comment here. Other people might have better luck than I did! I had a sample of this one some time back, and it didn’t really do much of anything for me. It seemed so light to me that I kind of wondered if I was missing something. There are some Byredos that I like, though (of the ones I’ve tried, which is hardly an exhaustive list). I really like 1996, and I remember liking Black Saffron a lot. This is the second mention of 1996. I’d better try it! And now you have me craving Jean Nate which I wore in the 1970s…Pulp, I think, is the only Byredo I have tried….liked it but did not see the need for a full bottle. I’ve sampled Pulp, too, and it scratched an itch, but that itch is more satisfyingly (for me) scratched by Bombay Bling. I needed a perfume that would fit a friend’s wedding in the woods on an unseasonably hot evening, and a sample of Gypsy Water hit the spot! But it’s not something I would reach for on a daily basis, being pretty boring and traditional and not at all gypsy-like. I can see that being a good fit! Gypsy Water is refreshing, but not too citrusy and sharp, and not too intrusive. I like Gypsy water, but on me, it’s very long lasting and skanky. I rarely use it, because I feel it’s not really ok for the office. My favorite Byredo is by far 1996, that one is a masterpiece. I wish I could smell it on you, because on me it’s neither long lasting nor skanky! Alas, the vagaries of skin…. I tried Gypsy Water in a store, and was horrified to find that I couldn’t smell it 5 minutes after spraying on my wrists. I thought something was broken in my nose! The SA assured me that was a common complaint, so I felt much better. Mojave Ghost and Oliver Peoples both smell amazing and last forever on me. Oh yes, forgot to mention Oliver Peoples, I like that one too. I’ll add Mohave Ghost and Oliver Peoples to my ever-growing list of fragrances to try…. Oliver Peoples is great, but it’s one of those Byredos that lasts about 2 minutes, at least on my skin.